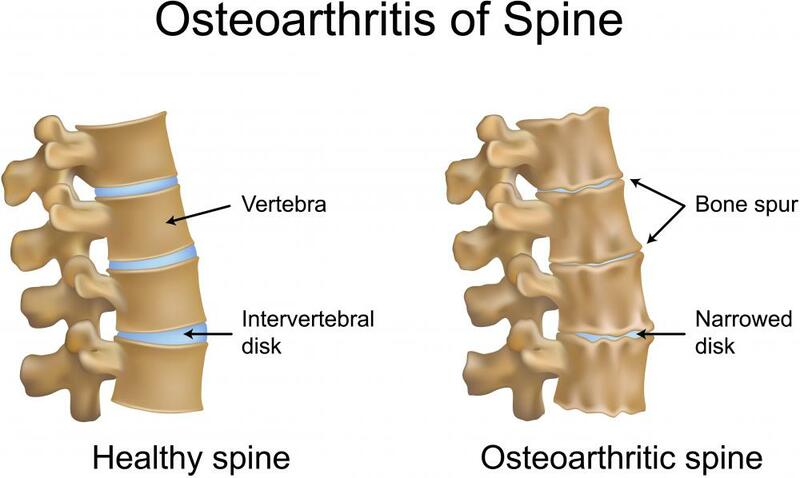 A picture of a healthy spine and one with osteophytes, also called bone spurs, connected with osteoarthritis. Osteophytes may occur after a fracture. 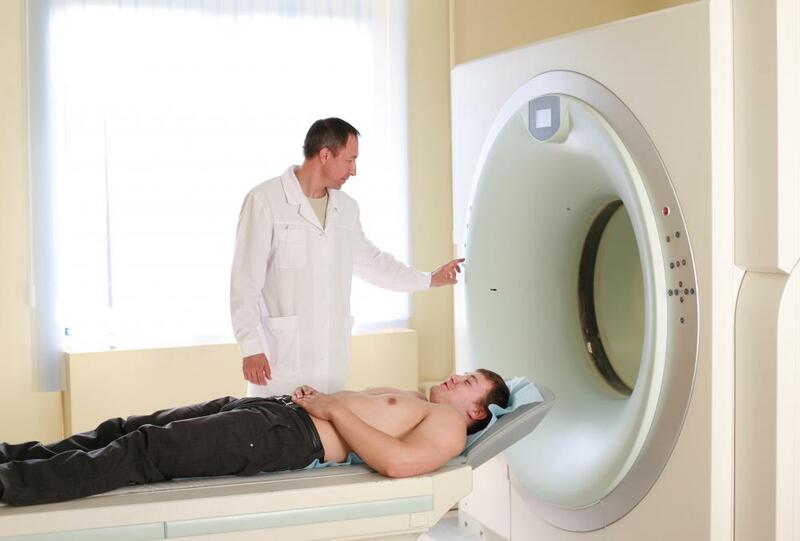 Some bone spurs can be identified through the use of a CT scan. A woman with bone spurs in her neck. Osteophytes that are located in the upper vertebrae can lead to dizziness and headaches. Osteophytes is the medical name for the overgrowth of bone tissue more commonly called "bone spurs." Despite the term "spurs," they are actually small round lumps of extra bone that grow around joints. Osteophytes are the body’s attempt to compensate for existing bone and ligament degeneration due to age or injury. Unfortunately, the body’s attempt to heal itself this way is unsuccessful. Bone spurs are formed by the body for the purpose of limiting or stopping motion in a deteriorating joint that becomes too loose. 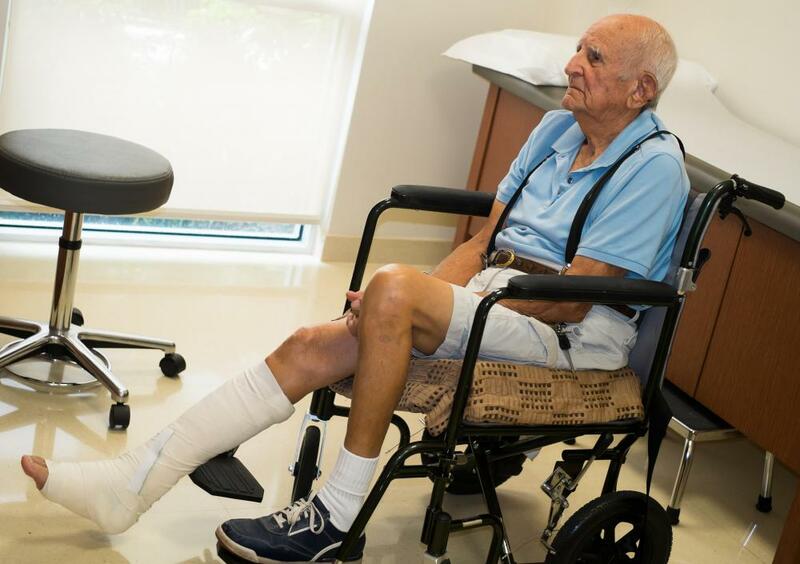 Since degenerative joint conditions are characteristic of athletes and the aged, osteophytes are common in those with sports related injuries or arthritis. In fact, they often cause arthritis, as well as a condition called spinal stenosis. Other factors in the development of spurs include bone deformations, fractures, hereditary factors and poor posture. Osteophytes are most often found along the spine, but they may be present on any bone in the body. Though not a source of pain themselves, they may create pressure on any of the nerves that branch out from the spinal column to result in painful and sometimes debilitating medical conditions. In many cases, a person with bone spurs may never suffer any symptoms. 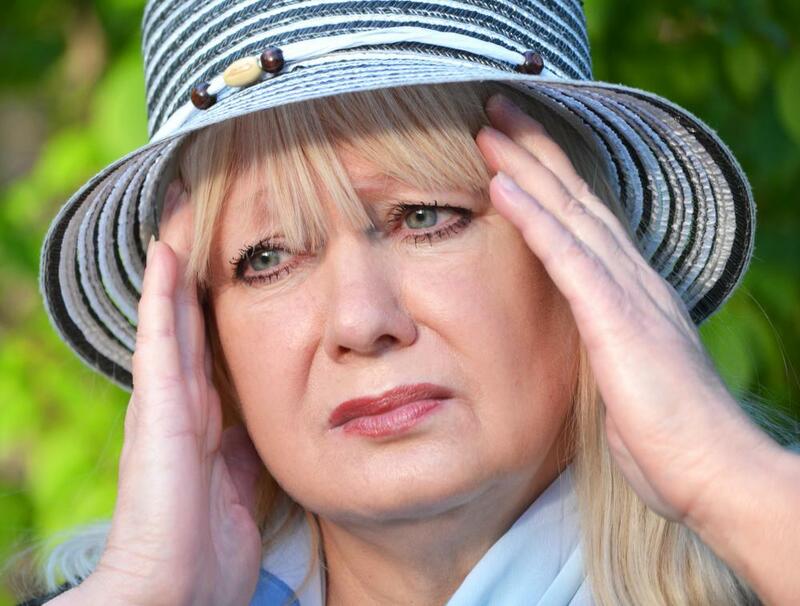 When symptoms do exist, they are usually due to pressure on any number of nerves in the body. Tingling or numbing sensations in the arms, hands, legs or feet can signify the presence of osteophytes along the spine. It is also common to experience muscle cramping, spasms or weakness. Depending on the size and location of the spurs, it is possible for sufferers to lose the ability to move part of their body. When they are present on the upper part of the vertebrae in the neck region, symptoms can include headaches, dizziness and general neck pain. The symptoms that result from osteophytes are also characteristic of other medical problems. To be certain that they are in fact caused by bone spurs, a medical professional will perform x-rays, magnetic resonance imaging (MRI), computed tomography (CT) scans and electroconductive tests to assess nerve function. Treatment may include anti-inflammatory medications such as cortisone, rest, physical therapy and, in severe cases, surgery. What are the Most Common Bone Spur Symptoms? I had a bone scan and it has been reported that I have anterolateral osteophytes at T9/T10 level of my spine. I am wearing a 'tens' machine that helps somewhat when driving the car but what are the long term issues/what can I do to ease the pain? This is a great article! Told me exactly what I wanted to know! Thank you so much for your help! I have a bone spur on my right hip and in the middle of my back on my spine just above the waist and it is very painful. But now I know just what to do, and who to go see to get help. Thanks a million for addressing this issue here on your wonderful site. I am a 32 year male. I have consistent pain in around my knee cap. X-rays suggest that I have marginal osteophyte growth on my patella. What does it mean? I'm suffering from left hand bone fracture pain. I have not an X-ray. I had the classical treatment when I was eight years old, but I have pain at 24 years old. What is the remedy? I have a lump of flesh on my second toe of my left foot. An X ray revealed underneath the lump was a small bone spur. I am a 42 year old white female. Not liking this at all. In February, I had right foot surgery to fix a stress fracture of the 5th metatarsal. I'm a single male, age 41. I'm a lorry driver for a small hire company contracted to a local box company delivering goods. I've just been told I have serve Osteoarthritis and also Osteophytes in both my hands (thumbs). I don't wish this on anyone. I'm in 24/7 pain, and now starting to have problems holding and lifting heavy objects. I am a 35 year old male. I've got an osteophyte issue also on my lumbar area. I feel back pain almost every day. I've got sublaxation degenration which has caused chronic dizziness and a headache. I am presently being treated under the care of a chiropractor. I'm a 43 year old female. I have just had a full body xray and I have been given my report and it has come back that I have osteophytes and my left hip is higher than my right one, and also the pelvic rotation to the left is seen. What can I do? There are a few more problems but I just want to see if anybody can give me advice. When I found my first bone spur about 10 years ago. It was on the inner ankle, and I had no idea that is was a symptom of degenerative joint disease, a.k.a., osteoarthritis. Now the second one has formed on the middle joint of the right ring finger. This was right after acupuncture for the swollen finger. Now my 'disease" has a name: Osteoarthritis. I'm am a 42 year old man and have been suffering with osteophytes in my neck for a year now. The pain is down my arm and from the elbow down it feels numb. I had to give up driving too, as the movement from driving causes the pain to get worse. i have had acupuncture which worked for a while but not lasted long. What can be done next? I'm a hairdresser. could this affect my job in the future? I am a 56 year old person. For the last month, I have been suffering knee pain in both knees. I have been feeling extreme pain in both knees. I cannot extend both knees fully. The X-Ray report says: Both knees AP lateral (standing) mild to moderate reduction in joint spaces is noted. Tiny osteophytes are also noted. I took calcium tabs for 15 days, and did physiotherapy for eight days as per the doctor's advice, but sometimes it still hurts. Please advise. Dasgupta, Mumbai. i am a 33 year old lady having complaints of knee joint pain for four years. i was diagnosed as having chondromalacia patellae. The x rays show osteophytes. My vitamin d3 levels are very low(3.6 pg/ml). what should I do? i have the same. only cortisone helps. addressed to nr 15.
my father is experiencing severe pain which affects the left side of his back and the nerve going down his left leg.He cannot go without his medicines. the doctor told us that he has lumbar osteophytosis. he was not able to walk for a month. He is 65 years old. what can be the remedy for his illness? I have been suffering from neck pain for the last eight years, caused from a fall. My doctor finally sent me for a cervical spine x ray. Since then, we have found the left c5 and c6 nerve foramina are narrowed as a result of osteophytes. Has anyone had this before? and how did you get this cured? I have had back pain for a couple of days. My GP ordered CT scan for lumbosacral spine. The results showed that I have osteophytes on my spine. Currently on anti inflammatory tablets 500mg twice a day. I decided to go join gym and lose a bit of weight. I am 160 cm tall and 61.1 kg is not assumed overweight. However, the lighter the better for the spine and I decided to go for acupuncture as well. I'll be updating my progress. I've been suffering from severe back pain for two years. Recent X-rays revealed that I have scoliosis in the dorsolumbar and lumbar spine, also osteophytes in the dorsal and lumbar spine. I'm 27 years old, female and overweight. Please advise. I am a 52 year old lady, suffering from early stage of osteophyte at my knees. what treatment is better for me? my weight is 78kg. I have had bone spurs on both ankles and do not recommend the surgery. i will be needing more. I have now also found out i have a spur on my spine at 24! meant to be after 60! so no idea what to do now! i have a bone spur in my toe, and i have had two removed from my toe nail. It is so painful. Back pain is fact of today's life style and allopathy system provides only the pain relief albeit, temporary. This condition can be best treated by alternative medicines like acupunture or SU JOK therapy without any side effects of drugs. One needs to search a good neighbourhood SU JOK therapist. I have a bone spur on my ankle which can get very painful after walking any distance as well as, what can only be described as a "big hard ball" appears on the top of my ankle. I have been to a specialist and they suggest surgery, however, my doctor and a few other professional people I have spoken to try and put me off it as it could cause further problems. I am terrified to have surgery in case it does make my mobility worse (I am a very active person.) Any suggestions or advice? I am a 46 year old very healthy female. I have had hip pain due to a spur for about two years now and the pain is so bad that it affects the left side of my back and the nerve going down my left leg. I cannot go without pain meds. I have had a ton of x-rays, three mri's on my back, hip and pelvis, a bone scan, two Chiopractors and physical therapy. All they can tell me is that it may be muscle pain. It is not muscle pain. Something like a bone spur is pressing against the nerve. I cannot take it any more. i want my life back. One doctor found a small bone spur on my hip but said he cannot take it off. He said he has never operated on anything like that. So, off to another doctor I go! I am a 46 year old married lady. I am suffering from severe knee pain. I went for x-ray report saying that osteophytes are near patella. What is the treatment for this? My health history is I have hypo-thyroidism and about 85 kgs weight. I am not able to walk continuously left knee is paining a lot. I'm suffering from severe back pain for 2 years. MRI does not conclusively show any remarkable damage. Recent X-Ray reveals Lumber Lordosis and Osteophytes. What is the remedy ? I'm 38 years married male, doing sedentary job.